This Sergio Lub style #747 Horseman handmade copper magnetic bracelet has two rare earth magnets and is made of pure metals. No plating is used and it is Made in USA. It is just under 1/2" wide. I am very pleased with the quality and look of this beautiful bracelet. I'm very pleased with the bracelett and the service from the company. Sergio Lub Copper Magnetic Bracelet Handmade Horseman 747. Got it for a friend. He likes it!!! It is comfortable, fits very well. Very happy with it. Likes it better than the one I got him 9 years ago. He had it off once for a half hour over all that time. . . it wore out so a few days later I got him this one. It looks great, too. Loved the bracelet. It was actually to big for my wrist and it was exchanged for a different style virtually hassle free. Great customer service. Love this bracelet! Beautiful craftsmanship! ITS BEAUTIFUL AND IVE RECEIVED ALOTS OF QUESTIONS AS TO WHERE I GOT IT FROM?I LOVE IT. 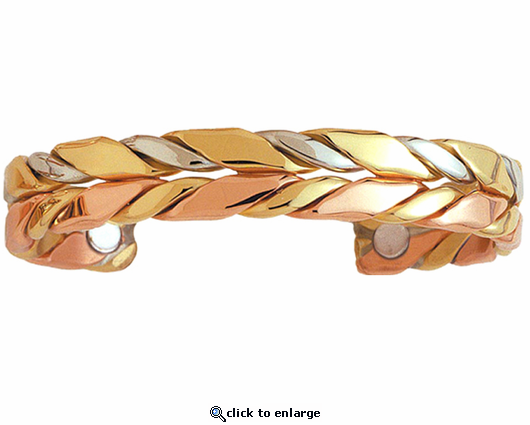 Very nicley made bracelet,nice fit, I would give this as a gift. It's very attractive and rich looking. Something new and still trying to get used to a new braclet as we were the same jewelry every day. Not quite sure yet if we've noticed a difference with health issues i.e. arthritus, joint pain etc.